Just two weeks into circulation, there are already different variants of the new Reserve Bank of India (RBI) Rs 500 notes+ , which experts fear could not only create confusion in the minds of the citizens but also aid counterfeiting — countering which was one of the top objectives of Centre's demonetization move and introduction of new notes. TOI found at least three case studies where the new notes have been found to vary from one another. In case of one note Abshar (he goes by one name), a resident of Delhi, says: "There is a more than visible shadow of Gandhi's face, besides alignment issues with the national emblem on the note and even serial numbers." Rehan Shah, a resident of Gurugram pointed out that the size of the borders of the notes were different. In case of two notes a Mumbai resident got when he made change for Rs 2,000 the notes were of different colours, with one being of a lighter shade. While he shared the picture with TOI, he refused to go on record. RBI spokesperson Alpana Killawala, said: "It is likely that notes with printing defect has got released due to the current rush. However, people can freely accept such a note in transaction or return it to RBI." Former Home Secretary GK Pillai told TOI: "Prevention of counterfeiting is almost impossible, with official mechanisms in Pakistan printing notes with access to as much sophistication as we do. So, it is only a matter of delay and temporary suspension of such notes in the country that one could have hoped for. I cannot yet comment on the Rs 500 notes as I am yet to see them, the Rs 2,000 notes are of good sophistication. That said, if the RBI says there is only one new 500-note it is printing, there should exist only one." 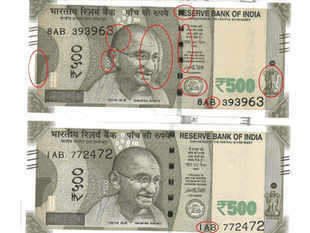 Experts pointed out that multiple variants of the official notes will aid people attempting to infuse fake notes. "As it is people find it difficult to understand all features of an official note and fail to check for everything before they accept one. Now, if there are too many versions of the official note, slipping in another would be easier than otherwise," a service IPS officer who has dealt with crime for many years said. Between January 2013 to September 2016, India has seized Rs 155.11 crore worth of counterfeit currency notes, Rs 27.79 crore of which was seized in the first nine months of this year. While the value of the seizures is hundreds of crores, the number of notes seized are only 31 lakh, indicating that majority of them were high denomination notes. Also, the seizures as security agencies point out time-and-again, are only a tip of the iceberg. Former DG&IG of Karnataka ST Ramesh, while echoing the views of the experts of different variants of notes aiding fake currency rackets, said: "Local printing of such notes has almost stopped. The notorious gangs from Coimbatore are more or less dead and all notes come in from outside through Nepal, Bangladesh and other countries. Different variants of official currency will certainly aid counterfeiting and it must be curbed immediately, unless of course, the RBI has strategically released this."